I wasn’t really planning to do Elf on the Shelf, but my mother-in-law bought it for the boys. Kenny and I have had a lot of fun setting him up each night. It is fun coming up with new ideas each night! Most days I have pulled out my DSLR and taken pictures to document what we do but there are a few iPhone photos. Here are a some things Ralphie has been getting into. 1. Ate some peanut butter cups. 2. Sitting in the Christmas Tree. 3. Hanging from the fan. 4. Driving Kenny’s RC Truck. 5. Watching TV a little too close. 6. Keeping an eye on us at the dinner table. 7. Opps got into the toilet paper. 8. Made some snowflakes. 9. Made a “snow” angel. 10. Hanging out in Dustyn’s room. 11. Drew a picture and asked the boys to draw him a picture. 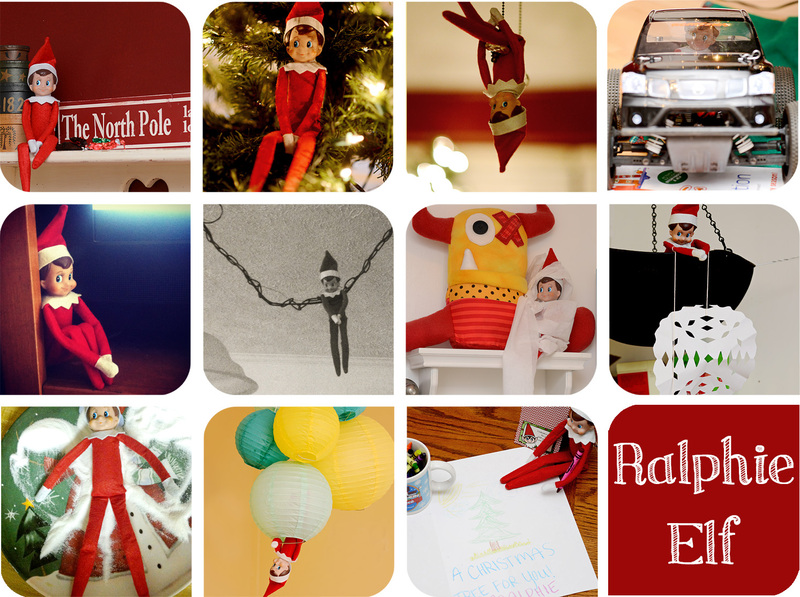 If you follow me on instagram @bysarahhalstead I have been sharing pictures daily using the #ralphieelf. Those are awesome! I love the one where he's "hangin out"
How fun! Ralphi is awesome! Great photos. All mine are iPhone. LOL I think I may "steal" some of your ideas! I'm looking forward to when Jackson is a little older and we can try the Elf on the Shelf. It looks like so much fun! Sarah, I think you hit me at just the right time! I'm in desperate need of a new look on the blog. I use blogger, will this work? Let me know what you think, and what you can do....So happy to help you in your quest! Cute shots of the elf and crew. Super cute! We have one that we did for a whole year (365 days of hiding him & them searching for him) & then the kids were too old. They named him Stanley. Ralphie is a busy fellow,giggle. Our grandchildren love the elf on the shelf tradition. xo P.S. thank you for hosting one of my favorite hops! Oh! it certainly looks like Ralphie has been quite mischievous and having lots of fun!! as well as mom and dad!! ha ha I especially love the snow angel! quite creative! Oh I so love the name you chose for your elf! A Christmas Story is my favorite holiday movie! So fun, love that elf's grin! Cute elf shots. It is hard to keep finding creative things to do with him. Cute shots. I don't know why, but when I copy and paste your button, it gives me the box your code is in and half of the button in that. Weird. I've tried every week for a long time and can't make it work. Any suggestions? I usually type your name and link like that. I haven't done Elf on the Shelf, but it looks like fun! Super cute pics. So, did you have a name change? Sorry I feel so out of it these days. I love your Ralphie ideas! Our kids love trying to find our Kringle every morning. I gotta step up my game this week! I've been a little lacking creatively this week. I love the idea of the elf, I'm just not sure I could keep up. Ha ha! Plus, my oldest is a terrible sleeper and is often up past 11, ugh! Your pics look like so much fun! Love my new header and button too! You did a great job ;) Thank you!! SO creative and fun! Hope the boys are enjoying! I can't wait to do Elf on the Shelf with my niece. Last year the mother and daughter authors of Elf on the Shelf were signing at our local Halmark shop. I picked up a copy of the book and Elf and am eagerly waiting for when she will be old enough that she can name the Elf (is only 1 1/2 ish now). Until than, I'll have to just admire your picture. ;) Fav is driving Kenny's RC Truck. My Samsung is not so great..but maybe I should try to shoot with it more.